Steve Martin misses the Big Bang at the Beginning of the 20th Century. An art historian once said that the visual arts in any artistic movement are always connected to everything else that is going on in society, whether it is artistic, scientific or political. 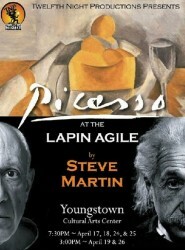 In the early 20th Century, these connections are particularly striking although one would not realize it from the play Steve Martin wrote, Einstein and Picasso at the Lapin Agile, currently at Youngstown Cultural Arts Center in West Seattle, produced by 12th Night Productions. In 1904, when the play takes place, The Lapin Agile ( The Agile Rabbit) was a Cabaret, not a café, located in Montmartre. Since Montmarte was an inexpensive suburb with a village like atmosphere, it was the center of the avant-garde literary and artistic life of early 20th Century Paris. Along with Picasso and other budding painters and writers, The Lapin Agile’s patrons were also low-lifers:pimps, prostitutes, con-men as well as the bourgeoisie slumming it. Into this mix, the 25 year old Albert Einstein stumbles shortly before the publication of his highly influential paper-The General Theory of Relativity. A discussion ensues between Picasso and Einstein about how creativity and imagination are not just the reserve of the “creative” professions but also drive the great scientific discoveries. . Although the subject matter was extremely interesting; in my opinion it was not exploited in any profound manner. The theme of the evening was how these two influenced the 20th Century, Picasso in art and Einstein in physics. Given that it was written by a comedian, there were a lot of zippy one-liners, which some of the audience found funny. However, the dialogue was very superficial and played for laughs; therefore it did not contain anything seriously enlightening concerning the human condition or its connection to the great questions of physics. Without a plot or character development, it never got beyond sit-com humor. Great humor always makes us laugh while expressing a profound truth about a serious subject. Perhaps it was opening night, but the pace was too slow for this sort of humor to be effective. In reality Einstein did have a thick German accent, but the director chose to sacrifice comprehension for authenticity and as a result Einstein came off as a characateur of a German academic instead of the complex highly creative genius physicist/humanitarian personality he was. However, the production values were spot on, my two French guests said the set looked exactly like an old run down café in Paris, the accordion music added a perfect touch and the costume of the bar-maid, looked exactly like the bar-maid in Renoir’s painting. A Bar at the Folies Bergère. The audience laughed at the appropriate places and the slow pace, may have been a result of opening night. If you like sit-com humor rather than Woody Allen humor, this may be a fun evening but if you are looking for a play which explains the connection between the revolution in physics caused by Einstein’s General Theory of Relativity, Picasso’s Paintings, Schoenberg’s atonal Music, James Joyce’s novels, and the aftermath of World War I, this is not the play for you.